Aberfeldy has many holiday cottages and small country hotels to choose from. Surrounded by outdoor activities like adventure safaris, white water rafting and quad biking plus scenic highlights such as Loch Tay, The Scottish Crannog Centre, Glen Lyon and Fortingall, Aberfeldy can cater for everyones holiday tastes. Aberfeldy is also a popular spot, with many pubs and restaurants offering traditonal Scottish hospitality. The Weem Hotel just outside Aberfeldy is the only 3 star hotel in Aberfeldy offering sunday lunches and superb traditional pub ales and meals. A great place to sit in the summer and take in the surrounding Highland countryside. The Ben Doran surrounded by Alpine forests boasts of a gorgeous mountain view, nestled in its own sheltered seven-acre garden in the mountain village of Tyndrum on the northern edge of the Loch Lomond National Park. The hotel was built creatively with the unique feature of having the dining room and lounges on the top floor to offer guests spectacular views of the beautiful scenery. Another masterful touch can be found in the design of the bedrooms which are extremely spacious and boast all the comforts you need to make your stay at The Ben Doran as tranquil and relaxing as possible. The gardens at Ben Doran have several lily ponds and extensive lawns, which are a haven for wildlife and the stage for our Head Gardener’s spectacular flower shows from spring till late autumn. With its beautifully kept and sparkling exterior, the Ben Doran is awash with colour all year round, inside and out. But you might also find colour of a distinctly golden hue. Tyndrum is sited on the Scottish Goldfield and, in 1997, a team of geologists found a gold seam only two miles from the village. There really is gold in them thar hills. Each accommodation at the 3-star hotel has mountain views and free WiFi. Guests can enjoy garden views. All guest rooms in the hotel are equipped with a kettle. All rooms are fitted with a private bathroom with free toiletries and a hair dryer. At Muthu Ben Doran Hotel rooms come with a wardrobe and a flat-screen TV. A Full English/Irish breakfast is available daily at the property. A number of activities are offered in the area, such as skiing and hiking. Fort William is 49 km from the accommodation. The nearest airport is Glasgow Airport, 66 km from Muthu Ben Doran Hotel. A traditional warm Scottish welcome awaits you at Moness House Hotel & Country Club. Set in 35 acres of picturesque countryside, in the heart of Highland Perthshire, the resort provides an ideal base from which to explore the surrounding area. The resort consists of a delightful hotel which has recently undergone a full refurbishment and now consists of a selection of 26 luxurious rooms, made up of family suites, romantic doubles, twins and single occupancy rooms providing something to suit everyone. A separate leisure complex, includes an indoor heated pool, steam room, solarium, snooker room, as well as a bar and choice of two restaurants. The historic Hotel, originally a hunting lodge dating from 1758 re-opened on 1st November 2008 and care has been taken to ensure the Hotel has been refurbished to the standards required to meet Scottish Tourist Board grading. We have some excellent winter offers as well as superb Christmas and New Year packages. No two hotel rooms are identical, with differing views, room sizes, floor levels, ceiling heights and location. While all rooms are furnished to the highest standard, certain rooms are a bit more special than others! Welcome to Cuil an Daraich, a family run guest house, near Pitlochry, in the Heart of Scotland. Come and enjoy the "home from home" relaxed atmosphere in this recently refurbished, imposing 19th Century property. Cuil an Daraich enjoys elevated views over the River Tay, nestled in the picturesque village of Logierait, ideally situated for exploring all the delights of Highland Perthshire. With five en-suite bedrooms, complete with welcome trays, hair dryers and tv's, the guest house is spacious and airy but small enough to offer an intimate and welcoming atmosphere. Within walking distance of the nearest village, Cuil an Daraich appeals to both the adventurous visitor and those simply seeking a highland retreat away from the hustle and bustle of "real life" The River Tay is world renowned for salmon fishing but many visitors come to Pitlochry to walk and, increasingly, to cycle. The Perthshire hills attract a wide variety of wildlife, flora and fauna. Located just off the A9, approximately five miles south of Pitlochry, Cuil an Daraich is the ideal base for exploring locally and further afield - Edinburgh is an hour and a half away, Glasgow and Inverness 2 hours away. Ideally situated for exploring the Perthshire Highlands, this family friendly hotel offers free Wi-Fi, an excellent restaurant serving home cooked food and Real Ale produced in the hotel’s own micro brewery. The hotel sits just 3/4 of a mile away from Pitlochry and offers a very appealing blend of traditional charm and modern comfort. Bedrooms have been tastefully decorated to an individual design and include a range of modern amenities, such as free Wi-Fi and flat screen TV. The delightful country inn-style rooms are away from the hustle and bustle ensuring a good night’s sleep. In dining the Moulin Hotel really comes into its own, with a local and regional reputation second to none. The high quality of its cuisine is regularly lauded, while the attractive Patio and beer garden is ideal to enjoy a drink, snack or alfresco meal. First opened in 1695 the original Moulin Inn is the oldest part of the hotel, with two log fires and stocked with Real ales produced in the hotel’s own Micro Brewery. 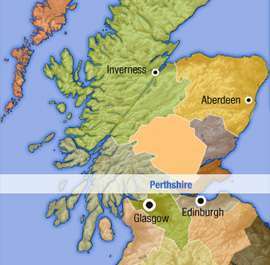 Take the A9 north from Perth or south from Inverness. The slip road to Pitlochry is well signposted 24 miles north of Perth and takes you straight onto Atholl Road. From Aberdeen take the A93 through Royal Deeside then the A924 south of Glenshee at Bridge of Cally, straight into town. Once you are in town ion the main street (Atholl Road), look out for the signpost for Braemar (A93) - Take this road for approximately ¾ mile up the hill out of town and look out for the hotel on the left. Perthshire's Cosy Wee Inn", located just off the A9 at Ballinluig and dedicated to providing great all day food and accommodation experiences to our guests, whether you are simply passing by, living in or visiting the area for business or leisure....our friendly, happy and helpful team look forward to welcoming you. We are located just off the A9 right in the middle of Perthshire in the wee village of Ballinluig, 5 miles south of Pitlochry or 5 miles north of Dunkeld with around 30 parking spaces onsite and more nearby. (please respect our neighbours access when parking) We have 11 very comfortable and well-presented en-suite bedrooms suitable for individuals, couples and small families with all the features you would expect of a good hotel. Schiehallion Hotel is a locally owned and managed hotel that offers a range of spacious en-suite rooms, which have been refurbished in keeping with four-star accommodation standards. We offer a lively bistro and bar atmosphere and easy access to local attractions, that makes us an ideal base in the Aberfeldy area. We are near transport options and two miles from Castle Menzies. The Schiehallion restaurant serves traditional, seasonal menu offering an excellent choice of meat, fish and vegetarian dishes using the best fresh local produce and a varied wine list. Breakfast includes fresh fruit platter cereals, porridge or a perfectly cooked full Scottish breakfast The bar also serves a fine selection of malt whiskies. The hotel also features a new gin bar and cocktail section, wherein you can choose from 30 gin and 10 cocktails as you cap off your day. Guests can have a relaxing stay in any of the comfortable rooms that come with flat-screen TV with Freeview, hairdryer, iron, tea- and coffee-making facilities, and complimentary toiletries. Family rooms are also available. For a more convenient stay, Wi-Fi access is available. Aberfeldy is set in the heart of the Perthshire Highlands, surrounded by Tay Forest Park. The area has so much to offer. Tourists may visit castles and distilleries or enjoy the great outdoors by walking, golfing, fishing or cycling. You may also try high-adrenaline activities such as whitewater rafting or bungee jumping. During free time, you can tee off at the nearby Aberfeldy Golf Club, just 10 minutes away from the property. Aberfeldy Taxi Service is also just a few steps away. Set deep in the heart of the Perthshire Highlands, this delightful area boasts Perthshire's highest mountain, deepest loch, longest glen and unrivalled outdoor recreation. You will find a warm welcome awaits you and the slower pace of life here is a major attraction, whilst several conservation villages and historic monuments add to the Aberfeldy area's unspoiled character and charm. Delve into Abefeldy's intriguing history at Castle Menzies, St Mary's Church (Grandtully), and Loch Tay's unique Scottish Crannog Centre or taste malt whisky at Aberfeldy Distillery and take home some newly milled oatmeal from the Aberfeldy Water Mill. The Old Mill Inn is a family owned and run hotel, recently renovated and offering excellent 4 star accommodation, food and service. The Old Mill started life as a corn mill and is situated right in the heart of the beautiful Highland resort of Pitlochry. From South: Cross the Forth Road Bridge and follow the A90. Continue onto M90. Exit at junction 10, exit toward A9/Inverness/Crianlarich/Stirling. At Broxden Roundabout, take the 2nd exit onto A9 heading to Inverness/A85/Crianlarich, Exit onto A924 toward A93. Follow the road into Pitlochry continue following Atholl road to the main street and The Old Mill is situated on the right-hand side over the pedestrian footpath behind the main parade of shops (Royal Bank of Scotland). From Inverness: Head northwest on A82/Kenneth St toward Fairfield Ln, At Telford Street Roundabout, take the 3rd exit onto A82. Go through 3 roundabouts. At Longman Roundabout, take the 3rd exit onto A9 heading to Aberdeen/Nairn/Perth/A96. Take the A924 exit toward A93/Braemar/Pitlochry, Turn left at A924. Follow the road into Pitlochry continue following Atholl road to the main street and The Old Mill is situated on the left-hand side over the pedestrian footpath behind the main parade of shops. Centrally located in a beautiful Victorian town of Pitlochry in the Perthshire Highlands, a warm welcome awaits you at Fishers Hotel, where you will enjoy first hand the traditional hospitality which has made Pitlochry a desirable destination for more than a century. Easily accessible from the A9, only 1 hour from Edinburgh and almost 90 mins from Glasgow, whether on business or pleasure, we are sure that you will leave having experienced a homely stay in what many people view as the true heart of Pitlochry, set within the stunning Perthshire countryside, the true heart of Scotland. With shops on the hotel doorstep, the train station at the back of the hotel gardens, there is no easier place to stay in Pitlochry with access to fun filled activities, some of the finest Scotch whisky distilleries, and historic sites such as Blair Castle and Scone Palace. The Kenmore Hotel & Luxury Lodges are nestled on the banks of the Tay in the village of Kenmore in Highland Perthshire. Kenmore is a beautiful little village which lies to the East of Loch Tay, with the loch to the West & South of the village and River Tay to the North. The Kenmore Hotel & Luxury Lodge are set amidst some of the most spectacular scenery in Scotland yet conveniently located only a few hours drive from Edinburgh and Glasgow. The Kenmore Hotel, Scotland’s oldest inn, features 40 charming and individually furnished rooms and suites with ensuite facilities, TV and coffee & tea making facilities. The Grill Room offers a stylish setting for dining with stunning views over the Tay and the elegant terrace that wraps round the restaurant is perfect for dining al fresco when the weather allows. The Boar’s Head bar, also with outside terrace, offers informal dining, whilst the Poet’s Bar, with its open fire and cosy ambience is a welcome place to enjoy one of the many fine Scottish malt whiskies – and it’s here that Robert Burns wrote a poem on the chimney – and you can still see it to this day! Surrounding the Hotel you’ll find Kenmore Luxury Lodges, an exclusive collection of 10 stunning 5-star lodges one to four bedroom self-catering lodges. These fabulous lodges afford unrivalled, panoramic views over the Tay, enveloped by majestic hills and mountains. Beautifully appointed to Visit Scotland 5-star standards, the lodges offer luxurious facilities, some with hot tubs, balconies and private gardens and all with the latest word in boutique hotel kitchens, bedrooms, bathrooms and furnishings. Residents of the lodges can enjoy privacy and exclusivity or take advantage of all the services and amenities available at the adjacent, historic Kenmore Hotel. The pretty village of Kenmore is a great base from which to enjoy a whole host of outdoor activities, though the lodges are so comfortable you might be tempted to just relax and enjoy the view! The Hotel and Lodges offer the perfect base for exploring the local area or simply spending some quality time with family and friends. With wonderful small towns nearby such as Aberfeldy and Pitlochry and a vast array of attractions and outdoor activities, Highland Perthshire has something to interest all ages and budgets. Whatever the reason for your visit and whether your interest is historical sites, outdoor adventure, speciality shopping or culinary delicacies, flora and fauna, or the great game of golf, you’ll find an abundance of things to see and do. From Perth drive North on the A9 and turn off at Pitlochry.Follow the main Road.Bonnethill Road is First Right afer the Tourist Board office.From Inverness drive south on the A9. Turn off at Pitlochry.Follow Main road.Bonnethill Road is Third on the Left. The Atholl Palace Hotel, the epitome of Scottish baronial splendour, stands imposingly overlooking wooded parkland grounds and the town of Pitlochry. Originally opened as the Athole Hydropathic in Victorian times, the property is now a major resort and destination with spectacular gardens, a spa and a museum featuring the life and times of the hotel. Welcome to a unique location, where the sounds of bagpipes may frequently be heard, where you will not forget the view of Ben-y-Vrackie as you stroll on the terrace in the evening sun, where a genuinely warm Highland welcome awaits you. Relax in the chandelier-lit lounges with log fires, or use some of the leisure facilities. The hotel features: an indoor swimming pool; Jacuzzi; sauna; fully-equipped gym; 9-hole pitch and putt course; putting green; tennis courts and snooker. An ideal centre for touring Scotland, with most areas being easily reachable on a day trip, during your stay you can also explore the wonderful natural surroundings. There are a number of walking and hiking trails as well as a number of adventure sports, including white-water rafting. Directions: Take A9 north, Pitlochry exit. Follow signs for hotel. Entrance to driveway immediately on the right after the railway bridge on the way into town. A special bed and breakfast experience awaits you at Beinn Bhracaigh. Eat, sleep, relax and enjoy the comforts of Beinn Bhracaigh - a hidden gem in a quiet enclave of Pitlochry. Pitlochry is a small town 40 minutes’ drive away from Perth. The nearest golf course is less than a mile from the property, as well as the Pitlochry Rail Station. This tasteful Victorian Country House built in 1889 yet sympathetically extended and decorated with a blend of antique and contemporary style provides a truly memorable bed and breakfast experience. Sleep on the highest quality bedding in spacious rooms with all the touches that you would expect in a hotel - style B&B. Simply decorated, rooms at Beinn Bhracaigh come with a flat-screen TV, a DVD player, a spacious en suite bathroom, and tea/coffee making facilities. Eleven of the twelve rooms overlook the garden as well as views of the scenic Perthshire hills. Eat in our intimate dining rooms, from our imaginative menu freshly prepared from your prior night pre-selection, with only the finest local ingredients. Local specialities include the grilled Dunkeld smoked salmon. There is free parking on site, a lounge, and a residents’ 'honesty' bar with over 50 malt whiskies, and a selection of Scottish beer. Relax and enjoy warm hospitality in the privacy of the south facing garden with panoramic views of the Tummel Valley. Guests can also enjoy a range of restaurants and cafés along Atholl Road. As you enter town from the south drive under the railway arch bridge and take the second road on the right ( East Moulin Road). Drive up this for approx 100m and take the second road on the left (Higher Oakfield). Muthu Royal Hotel, a 3-star hotel, is a property situated in 4 acres or landscaped gardens in Tyndrum. This 3-star hotel offers free WiFi and guests can enjoy the bar. At the hotel, all rooms are en suite with a flat-screen TV, tea and coffee making facilities and a hairdryer. A continental breakfast is available, and guests can enjoy the views from the dining room. Fort William is 49 km from Muthu Royal Hotel, while Oban is 47 km away. Glasgow Airport is 66 km from the property.